CSZ completed installation of a temperature cycling chamber for testing NASA’s Orion spacecraft that will take humans back to the Moon and one day out to Mars. Testing procedures and processes are an integral part of development of any new technology. The spacecraft will undergo a series of critical tests over the next 24 months to ensure reliability. These tests consist of exposure of the spacecraft to a multitude of stresses including: structural and mechanical testing, vibration testing, temperature and humidity testing, pressure testing, acoustic testing and electrical systems testing. Thermal cycle testing is one key aspect of the overall test protocol. The CSZ chamber is being used for acceptance testing to ensure functionality and screen for potential workmanship defects. To support testing requirements for the project, CSZ provided a massive chamber with over 15,000 cubic feet of workspace (25’W x 25’H x 25’D). Along with its immense size, the chamber was required to meet very high performance standards. Among these standards was an established temperature range of -20°F to +220°F. 24’ x 24’, a heavy duty floor designed to support a maximum load of 33,000 lbs. and 4,300 PSF, a large custom-designed cooling system to mitigate the heat load and HEPA air filtration system for the workspace. These were just some of the unique aspects of the design. Through collaboration between the expert design engineers at CSZ and the Lockheed Martin team that is building Orion, we were able to provide the test solution Lockheed Martin needed for this mission critical project. 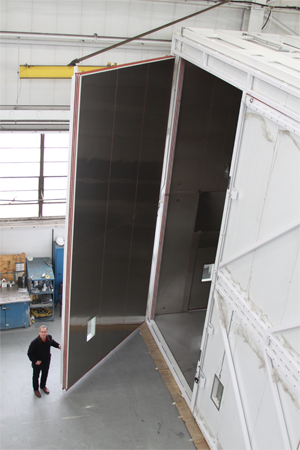 “We are excited to be part of the Orion spacecraft project and are also proud of our experienced team and ability to provide custom-designed testing solutions for our customers” said Steven Berke, CSZ President.